Volcano Watch: What causes the collapse/explosion events at Kīlauea’s summit? 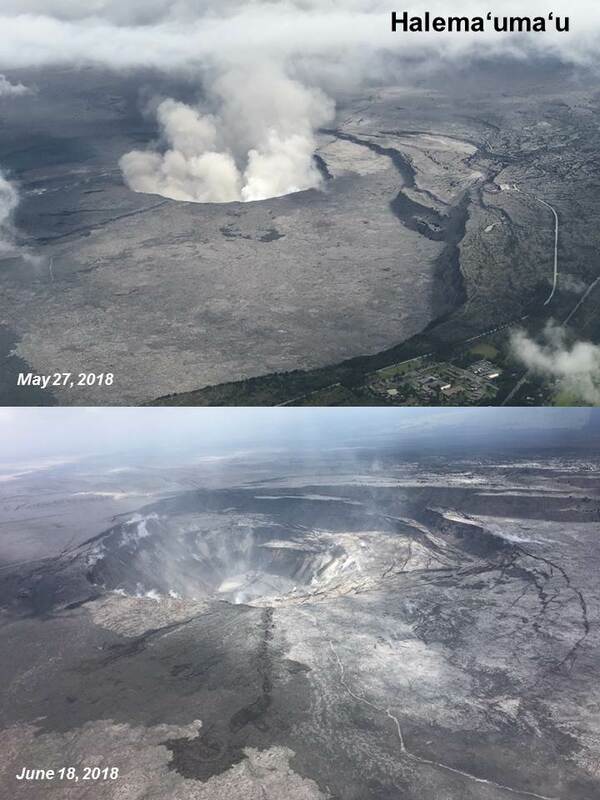 At the summit of Kīlauea Volcano, Halemaʻumaʻu has changed dramatically since early May 2018. As the crater walls and inner caldera slump inward, the depth of Halemaʻumaʻu has more than tripled and the diameter has more than doubled. Before May, about 10 earthquakes per day were typical at the summit. As of late June 2018, there are about 600 earthquakes located in the same region on a daily basis. Many of these earthquakes are strong enough to be felt, and some can be damaging. These earthquakes are understandably causing concern, especially in Volcano Village and surrounding subdivisions. What is causing these earthquakes? The short answer is that the rigid rock of the caldera floor is responding to the steady withdrawal of magma from a shallow reservoir beneath the summit. As magma drains into the East Rift Zone (traveling about 40 km (26 mi) underground to erupt from fissures in the Leilani Estates subdivision), it slowly pulls away support of the rock above it. Small earthquakes occur as the crater floor sags. The collapse/explosion event is triggered when the caldera floor can no longer support its own weight and drops downward. Large collapses can produce an explosion and ash plume that rises above the crater. An example of this is the most recent event that occurred on June 28, 2018, at 4:49 AM HST. An ash-poor plume rose about 300 m (1000 ft) above the ground and drifted to the southwest. The energy released by the event was equivalent to a M5.3 earthquake. Since May 16, we have observed intervals between collapse/explosion events as short at 8 hours and as long as 64 hours. The average is about 28 hours, which is why they seem to happen on an almost daily basis. Analyses of data from tiltmeters, GPS stations, seismometers, gas measurements, satellite and visual observations are ongoing, and several hypotheses could explain the processes occurring at the summit. A leading concept is that incremental collapses beneath the caldera act as a piston dropping on top of a depressurized magmatic system. 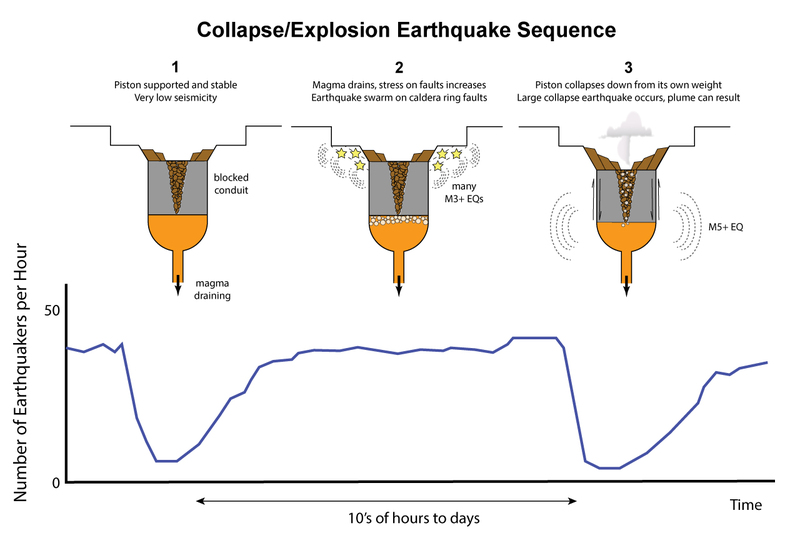 This collapse process culminates in a large earthquake that may be strong enough to be felt by residents in the area. It also can produce an explosion in which gas drives ash into the atmosphere. After a large collapse/explosion event, the stress on the faults around Halemaʻumaʻu is temporarily reduced, resulting in fewer earthquakes. Several hours later, as magma continues to drain out of the summit, stress increases on the faults around Halemaʻumaʻu and earthquake rates increase and grow to a constant level that continues for several hours before the next collapse/explosion event. The collapse/explosion events generate plumes that have become progressively more ash-poor and now rise only a few thousand feet above the crater. This is in contrast to the eruptive sequence from May 16-26, when the vent within Halemaʻumaʻu crater was open so ash plumes could rise into the air during each collapse/explosion event, like the event on May 17, 2018, that sent an ash plume to 30,000 feet. But by May 29, rock rubble from the crater rim and walls had filled the vent and a portion of the conduit that comprises the shallow magma reservoir may have partially collapsed, blocking the path for most of the ash to escape. Since June 21, nearby residents have reported feeling stronger, more intense shaking from the collapse/explosion events. Why do they feel stronger when the location and magnitude are about the same? It is possible that another partial collapse of the shallow magma reservoir occurred, also changing subsurface geometry. This changed the character of the seismic waves, which now have more high frequencies (shorter wavelengths) that people may feel more intensely. An analogy is a home theater or car stereo. Imagine you have it set at a constant volume (like the consistent earthquake magnitude) but then change the dials to increase the treble while lowering the bass slightly. The total energy is the same, but it’s just being expressed in different frequencies. This is why, over time, people may be reporting that they are feeling these events more widely and intensely. One of the most frequently asked questions is when will this end? The response is not so straightforward. The summit continues to subside as magma moves from the shallow reservoir beneath the Kīlauea summit into the lower East Rift Zone. As this process continues, Halemaʻumaʻu will continue to respond with collapse/explosion events. If you feel strong shaking, remember to drop, cover, and hold on until it stops. Be sure to quake-proof your home, school, and business. Look here for tips: www.shakeout.org/hawaii/resour…. Also, please help the USGS by reporting if you feel an earthquake at earthquake.usgs.gov/dyfi.